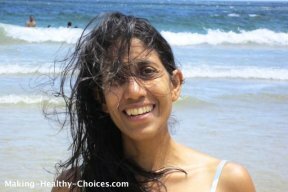 A little about me... My name is Nadia Harper, the author of Making-Healthy-Choices.com. This website has lived in my head and heart for many years, how happy and honoured I am to now share it with the World. I struggled for a long time trying to figure out how to build the website that I envisioned in my head - click here to read how I built this site. I am a Holistic Nutritionist and hold an HBA degree in Psychology. I also have a certificate in Natural Hygiene and have completed yoga teacher training, raw food preparation training, Reiki and EFT training and have attended several 10 day silent meditation retreats – aspects from all of which I incorporate into my daily life. As much as I learn from my many trainings, I find that my most valuable lessons often come from spending time with elders and learning how our ancestors did things. My passion for holistic health encompasses discovering my own potential and helping others to do the same. I was born and raised in Canada and then, as an adult, I lived and travelled in Asia for almost a decade and a half. Travelling alone with a backpack on my back is the best education I could have ever given myself! 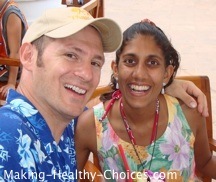 During this time I spent several years as the Executive Health Advisor at world famous detox retreat in Thailand where I helped thousands of people through cleansing programs and with advice to take home with them on how to make healthy lifestyle choices. A few other highlights from those years include circumambulating Mount Kailash in Tibet, studying and training with Sunyogi (sun gazing) and learning and living in Nepal, India and Japan to name just a few of the amazing places I spent time in and people I met along the way. In 2008 I married John and together we continue to enjoy travelling and living within North America as well as overseas. Every day I am grateful for my life and for everything and everyone in it. My purpose for this website is to share what I have learned and what I have experienced about how to live a healthy, natural and happy life. It is my hope that you will find something here about holistic health to enrich your own life. Along with private coaching, I am also honoured to coach clients through The Gabriel Method and I warmly invite you to visit my bio page over there to learn more about me and my vision when coaching clients.